I saw a great new musical – A Gentleman’s Guide to Love and Murder based upon the 1907 novel which was turned into the 1949 movie classic Kind Hearts and Coronets. It is perhaps the best new musical since The Book of Mormon. It is staged in a traditional English musical hall format of having a second stage mounted within the main proscenium with Austrian curtain that raises and lowers for each of the changing scenes. While reminiscent of The Mystery of Edwin Drood, the score is both organic and has assimilated the work of Gilbert & Sullivan, Stephen Sondheim, Noel Coward, and Musical Hall songs. All together the company manages to present Tom Foolery that is sharp and witty as if the work has been simmering for 100 years in comedic heavens – only to emerge fully blown and evolved into a comic masterpiece. The cast runs like a well oiled stock company that has been performing this work until it is now fully honed. 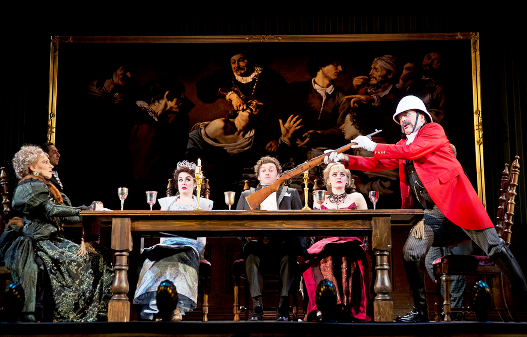 Jefferson Mays plays the many faces of the varied “D’Ysquith” assassinated dynasty. He is suitably broad in his characterizations and seems to be the noble descendant of Monty Python. His spoiled sprigs on the family tree are mostly stuffed shirts or stuffed skirts — and are performed so dazzling by him that you will laugh too hard to shed a tear for any of them. But surprisingly it is Bryce Pinkham who shines the brightest, not only as he piles up the bodies of his estranged family. He is wonderfully zestful as he is dispatching those in his way to the Earldom – at the same time his boyish charm and charisma are evident as he courts both the seductive Sibella played by the talented Lisa O’Hare, and the Virtuous Phoebe wonderfully vocalized by Lauren Worsham. Despite the high body count, this amusing show will lift the hearts of all those pining for what sometimes seems a lost art form: musicals that match streams of memorable melody with witty turns of phrase. Bloodlust has never been sung so sweetly or provided so much theatrical fun for many a year. Walter Kerr Theatre, 219 West 48th Street, New York City. New York Theatre Review: Murder on Broadway! 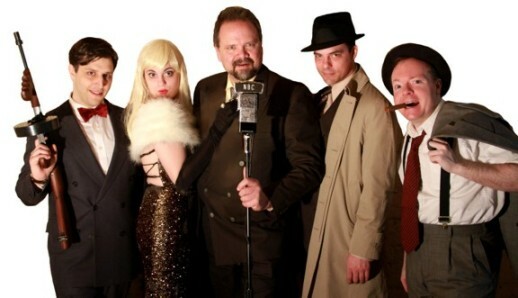 I had the great good fortune of seeing RadioTheatre’s latest offering Murder on Broadway!, the third production from this talented group that I have had the good fortune to be entertained. They get better with every new work and manage to convey the “Theatre of the Imagination” to its highest levels by means of their talented vocal impersonation, along with the wit of their scripts. Playing a multitude of roles, they flow seamlessly from character to character – no one more than Zoe V. Spears who doubles for all of the female characters during the evening’s performance. On their bare stage without props and only with their voices, they entertain and convey a myriad of different settings, genres, with a cleaver and witty acumen. Located in the very intimate Sophie’s @ Broadway, it is amazing how well the audience reacts to these talented actors. Frank Zilinyi as the Host/Narrator presents a voice as full and rich as Orson Welles. Joshua Nicholson is just as fascinating to watch when he is off-microphone reacting to the others performing, as when he is on the airwaves. Cory Boughton as the Gum-Shoe works nearly the whole 90 minutes with little relief – and is excellent. Philip Casale is also stellar as the young actor George. If I have any criticism, it lies with Eduardo Ramirez the sound engineer – who keep the underscoring music throughout the performance at too high a level so that at moments it drowns out the voices of the actors. While the music and effects are cleaver and interesting, I came to hear the actors and not his sound mixing. Murder on Broadway! is for all ages – especially those who are too young to remember sitting in front of the radio console and letting our imagination fill in all the details from the radio dramas – making it the perfect entertainment. Broadway’s “Act One” – a springtime treat!! Act One: a springtime treat!! I had the great pleasure in seeing James Lapine’s new play Act One, based upon theatrical-legend Moss Hart’s 1959 autobiography. The play adheres to his original book, which is a fictionalized reworking of events of his life – perfect in presenting life not as it was – but how Mr. Hart would have preferred it to have been. In addition, the second act is a must see for all future toilers of the theater – presenting the amazing and difficult process of the evolution and heartbreaks of creating any show on Broadway. The enormous revolving set by Beowulf Boitt is a treat to the eye, presenting the various degrees of poverty and affluence of the stages of Mr. Hart’s life up to the opening of his first great hit Once in a Lifetime. The large cast is remarkable and quite talented as they double and triple play various roles. But three must be singled out for their exceptional performances: Santino Fontana as the adolescent to adult Moss Hart is amazingly adept at portraying the rather Dickensian existence that Hart traveled from his youth in the Bronx to his almost impossible escape to the magical world of Broadway and the icons who existed there. His portrayal is both gleeful and exhausting to watch. Mr. Tony Shalhoub’s appearance in the second act as George S. Kaufman was so surprising that I almost didn’t believe that it was him, after seeing him appear as Papa Hart, and as the narrator — middle aged Moss Hart. He managed to incorporate all of the phobic mannerisms of the celebrated actor/director/playwright, along with comical moments that he managed to convey without uttering a single word. Finally, Andrea Martin of whom I have been a fan for decades, was perfection as she played the totally daffy Aunt Kate and as the urbane and charming Beatrice Kaufman. She never disappoints. Act One is a great Spring-time treat for all New Yorkers and is not to be missed!! 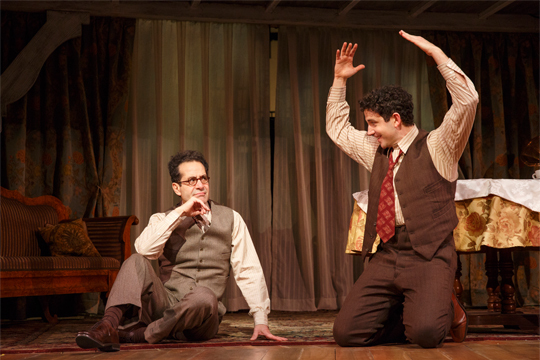 ACT ONE is nominated for five 2014 Tony Awards!